Move aside Cannes and Tropfest, the SimFringe Film Festival is hitting town! We are introducing a concurrent digital conference where you are invited to submit a short 5-min film showcasing YOUR activities related to congress theme of Balance and Disruption. Show us what you are doing now! Have you just started or almost finished? Are you stuck and not sure which direction to move in? Do you want some feedback on an element of what you are doing to improve it? We want to see what you are doing/have done and open the communication lines for those who are not able to physically make it to the Congress. We will host your short video online so everyone can see and provide moderated feedback, showcasing your work to a larger audience. Be involved in ASC19, from your home! #ASCLounge Where ideas are shared. All ASC attendees are invited to come and share ideas in “The Lounge”. As part of the Exhibition Hall, The Lounge is a place where ASC attendees can meet others, share ideas and discuss the future of simulation, modelling and gaming. It’s a space to chill, recharge (both you and your devices) and to hear briefs on different topics as per the schedule. Women in Simulation – a Community of Practice? Morning Tea Getting to know you – ASC First Timers are invited to the lounge to connect with people from all streams, plan your conference time or set your social media plans. Our goal is to welcome to new delegates, help orientate people new to the community and encourage use of social media during and after the Congress. Afternoon Tea Freestyle networking – you are invited to use the lounge and share what you are doing with other delegates and learn what other people are doing. Our goal is to encourage people to share reflections on presentations already seen and learn what other delegates are doing in a relaxed, casual space. Lunch VR headsets – details tbc. 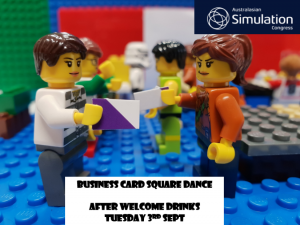 Business Card Square Dance (#ASCsquaredance) – bring 5 of your business cards and a pen – you will have 10 minutes to find something in common and swap cards.